Self Transformation & Improvement :. OmegaBT inc.
My Goldfish Ate My Cat! Through the years, Chantal Beaulieu Lynch has coached hundreds of men and women. She has guided them in creating a more fulfilling, meaningful and productive life. She has been sharing her knowledge and experience by providing insightful presentations and workshops where she speaks from the heart. 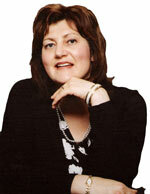 Chantal has been interviewed on the radio for her expertise as a coach and speaker. She is the author of the book: The Art of Creating a Meaningful Life: One Day at a Time released in March 2008.